What’s the recipe for a great summer novel? Page-turning suspense, for starters, and a plucky heroine for whom to root. Lyrical writing is a bonus, as are reversed roles and upended expectations. Mix in a Cold War setting and radical politics, garnish with an exotic locale and a dash of sexual frisson, and the result is a frosty cocktail guaranteed to quench even the most parched reader’s thirst for a satisfying dog-days diversion. Meet Vera Kelly. Vera is a CIA operative on her first mission abroad. The year is 1966, and Buenos Aires is a hotbed of student activism, KGB infiltration, and political instability. Vera’s assignment there is twofold. First, with the aid of Nico Fermetti, a local CIA asset, she is to bug and monitor the Congreso Nacional office of Argentine vice president Carlos Perettte. Second, and this time on her own initiative, she is to pose as a Canadian exchange student in order to infiltrate a Marxist cell within the Universidad Central led by Román Orellanos, a charismatic law student suspected of having recently purchased a large quantity of explosives. 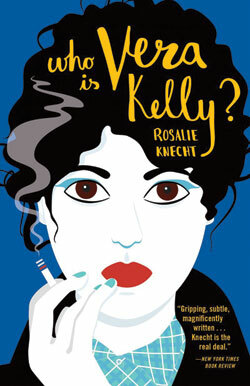 While that setup, courtesy of Rosalie Knecht’s delightful second novel, might sound straight out of a John le Carré thriller, it is there that the similarities end. Instead, Who is Vera Kelly? leans more toward literary character study than plot-driven whodunit, and the chain-smoking, gin sipping Vera is more an adult Nancy Drew than a web-spinning spymaster of the George Smiley ilk. Vera’s insinuation into Román Orellanos’ orbit of student radicals requires another type of seduction in the form of her coerced friendship with Victoria, Román’s girlfriend and co-conspirator, an arrangement that evolves its own complications. Then, when a coup d’état upends the Argentine political order and separates Vera from her handlers, she’s forced to rely on her wits and her training to find her friends, avoid her enemies, and determine which are which. If an intelligent, literary, female-driven spy thriller sounds like your cup of (iced) tea, then by all means add Who is Vera Kelly? ($21.95, from Tin House) to your summer reading list. MARK YOUR CALENDARS: I’m also excited to announce that New York Times-bestselling author Jonathan Evison (West of Here, The Revised Fundamentals of Caregiving) will be at the Cortez Public Library on Friday, July 13 at 7:00 p.m. where we will discuss, and where Jonathan will sign, his latest novel Lawn Boy, which I reviewed here in March. I hope you’ll join us for what promises to be a lively evening of literary conversation with a man thrice nominated by the American Booksellers Association as “America’s Most Engaging Author.” See you there! From July 2018, Prose and Cons.